If you only think of snails as a delicacy, a luxury item that’s reserved for the appetites of the rich and famous, then think again. 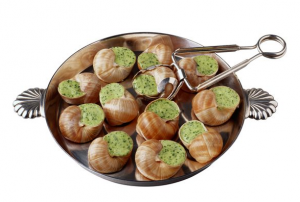 While it might not be on the menu in your local cafe, there’s very good reasons why you should go get some escargot to put on your own plate. Not for the social status and bragging rights, or to appear worldly-wise to your pals. It just turns out that eating snails, and snail eggs, can actually be really good for your health too! While many of us turn to seafood for our source of protein, we may be surprised to find that snails actually contain more of the stuff that helps us build and repair muscle. They’re a low-calorie dish ideal for gym bunnies, as long as you avoid the recipes that involve drowning them in butter and cream, of course. Feeling a little run down and maybe slightly anaemic? You may not be getting enough iron in your diet. While a pint of Guinness is a pleasant way to top up your iron, you’ll actually get way more by chowing down on a plate of molluscs. Snails’ iron content will help your body produce red blood cells and add a little more energy to your tired limbs. Also good for your energy levels is Vitamin B12, deficiency in which can lead to fatigue, depression, and even in long-term scenarios, damage to your brain and central nervous system. Thankfully snails are packed with B12 to ward off these effects. And should you want to put your newfound pep to good use, it’s also been discovered that snail eggs can be a natural aphrodisiac! This ‘white caviar’ or ‘pearls of Aphrodite’ contains just 90 calories in a 100-gram serving – all the more reason to tuck in. Being deficient in magnesium can produce some scary symptoms: tremors, spasms, and an inability to concentrate. So putting the gastropod in your gastronomy is a good way to help your body maintain healthy blood pressure and heart rate, as well as helping to build strong bones. We don’t often think about the amount of selenium in our diet; in fact, we only need a small dose but it is essential to an effective metabolism. Some research indicates that it may reduce the risk of prostate cancer, so that’s as good a reason as any to get your dose from our shelled friends. Everywhere one turns these days we are told about the benefits of Omega-3, the fatty acids that will keep our hearts ticking over properly. Okay, so they’re no competition for the amount found in oily fish, but if you’ve had your fill of sardines, then you can also source that Omega-3 in a big bowl of Cornu apsersum – yes, that’s a snail, too. There’s little point in feeling good if you don’t look good too, and we are again rescued by our humble garden dwellers. Recent research has discovered that a substance snails produce to heal their own skin and shell can do wonders for our own skin. Chilean snail farmers found that they had remarkably smooth hands and any cuts healed super-fast – the substance now known as Helix aspersia Muller contains collagen, elastin, and other vitamins and minerals that aid the skin. So maybe with snails in your tummy and slime on your face, you could be a picture of health.